Although we tested these high-end graphics cards with only seven games we feel it was a solid and representative line up. A few new games were included such as Metro 2033, Just Cause 2 and Battlefield Bad Company 2, while some older yet still significant games for measuring graphics card performance were included like Crysis Warhead and S.T.A.L.K.E.R. : Call of Pripyat. The GeForce GTX 480 vs. Radeon HD 5870 comparison certainly didn't turn out as we were expecting, especially given what we had already seen in our original comparison, where the GeForce GTX 480 was on average 16% faster. Now with newer drivers we were expecting this margin to open up a little, further favoring the Nvidia graphics card. This was not to be as the margins appear to have been reduced instead. Of course, we have changed our testing methodology for this article by using FRAPS to measure performance, while the focus was more on real-time gameplay instead of time demos. 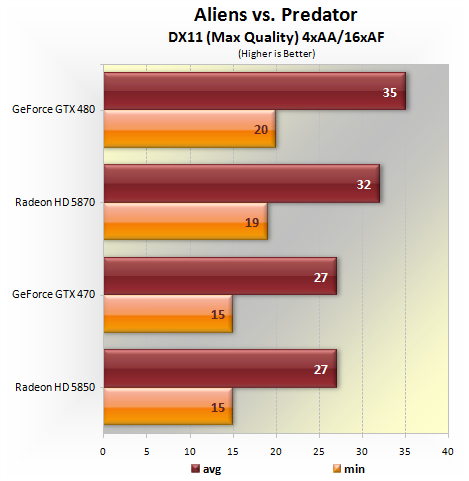 For the most part the GeForce GTX 480 and Radeon HD 5870 delivered similar results which again was a little surprising. Games such as Battlefield Bad Company 2, Resident Evil 5 and Wolfenstein showed almost no difference in performance between the two higher-end cards, generally favoring the GeForce but by slim margins. Another surprising set of results were found when testing with Crysis Warhead. The GeForce GTX 480 was just ~3fps faster when measuring both the minimum and average frame rates, which is considerably less than what we observed last time using a time demo. Later on we observed this radical change came from the maxed-out 'Enthusiast' setting we used for this article, compared to the 'High' setting used previously. On the latter GeForce boards tend to perform better than the Radeon boards. 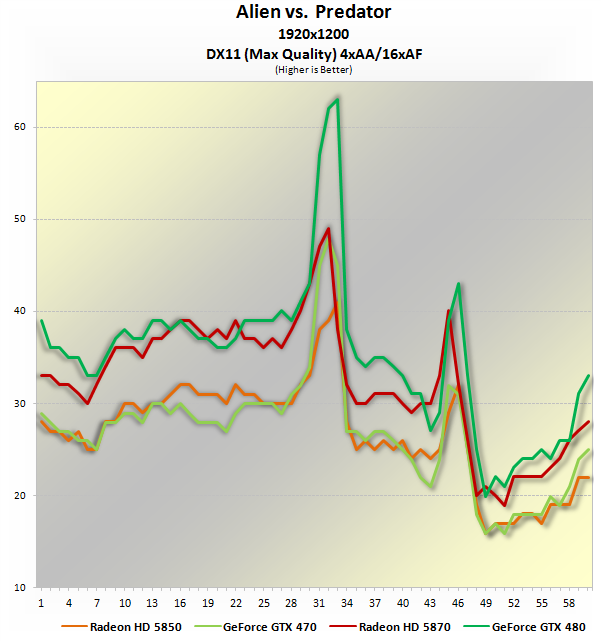 The biggest performance margins where playable performance was still obtained were seen when testing with S.T.A.L.K.E.R. : Call of Pripyat and Just Cause 2. The GeForce GTX 480 was on average 5fps faster in S.T.A.L.K.E.R. : Call of Pripyat with Tessellation enabled, while on Just Cause 2 we saw a similar trend taking the lead by a comfortable margin in both average and minimum fps*. Finally, the GeForce GTX 480 dominated Metro 2033 by a 7fps margin with Tessellation enabled, though with an average of 28fps and a minimum of just 21fps this was a hollow victory. At 1920x1200 we feel Tessellation is better off disabled in order to achieve smooth gameplay and doing so still leaves the GeForce GTX 480 on top for this game. The GeForce GTX 470 vs. Radeon HD 5850 comparison can be summed up much more easily. The Radeon HD 5850 was without a doubt the superior performer in our testing, washing away the GeForce GTX 470 in all but two games. Even when the GeForce GTX 470 hit the lead when playing Metro 2033 and S.T.A.L.K.E.R. : Call of Pripyat it was by a small 1-2 fps margin on average. Take into account that the GeForce GTX 470 sells for ~$50 more ($350) and the choice becomes quite obvious. In fact, value is the real showstopper for Nvidia’s current generation GPUs in our opinion. Although the GeForce GTX 480 is unquestionably a beast, at $500 it is an expensive one that sells for a $70-$100 premium over the Radeon HD 5870. So two months later, both AMD and Nvidia have delivered new drivers for their current generation GPUs and very little has changed. The GeForce GTX 480 is still very fast, on the expensive side, and very power hungry. The Radeon HD 5870 on the other hand is almost as fast, it's a better value per dollar, and much more fuel efficient. For those reasons alone the Radeon HD 5870 still gets our seal of approval. Update: If you want to see operating temperatures and power consumption figures, you can refer back to our previous review. Update 2*: Mea culpa. When we published this performance review earlier this week, we unintentionally overlooked two Nvidia-specific settings that are available in Just Cause 2 (Bokeh Filters and GPU Water Simulation). These CUDA features are enabled by default when selecting the 'High' preset and thus negatively impacted performance making for an unfair comparison against the ATI Radeon boards. The updated graphs reflect an accurate measure of apples vs. apples performance. Update 3: Since publishing this article we have received numerous feedback, but we are glad to report the only glaring issue was with the Just Cause 2 numbers (see the above note). We recently also tested with one additional game, Aliens vs. Predator, here are the graphs if you want to check those out.